One of the nicest things about having a day off work during the week is that you can travel around the city when everyone else is at work. Everything is open, but the streets are populated mostly by people with free time, and the atmosphere is very relaxed and laid back, unlike when hordes of 9-5 workers are around after hours or on weekends. On such a fine day, I took a drive to the posh north shore suburb of Mosman, to partake of some of its fine array of victuals. Mosman boasts a swag of high fashion outlets, boutiques, and a high end toy shop featuring such children’s playthings as rocking horses and hand carved wooden soldiers. 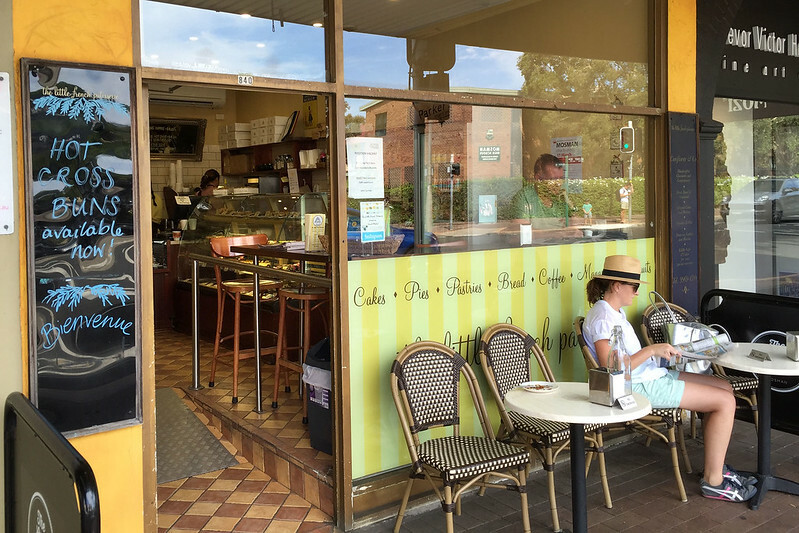 On the food side, there is a gourmet butcher, and Italian delicatessen, a specialty cheese shop, plenty of trendy cafes, and this place: The Little French Patisserie. It boasts a mouth-watering array of French pastries, croissants, tarts, bread, macarons, and other goodies. In deference to its location in the southern hemisphere, it also tries its hand at various Australian standards. A pie warmer boasts beef and chicken pies, each with a French flair to the sauce lurking within, as well as pork and veal sausage rolls. You can also buy these products cold, to take home and reheat – in fact most of the output appears to be in this form, with only a few hot pies and rolls ready to eat in the warmer. 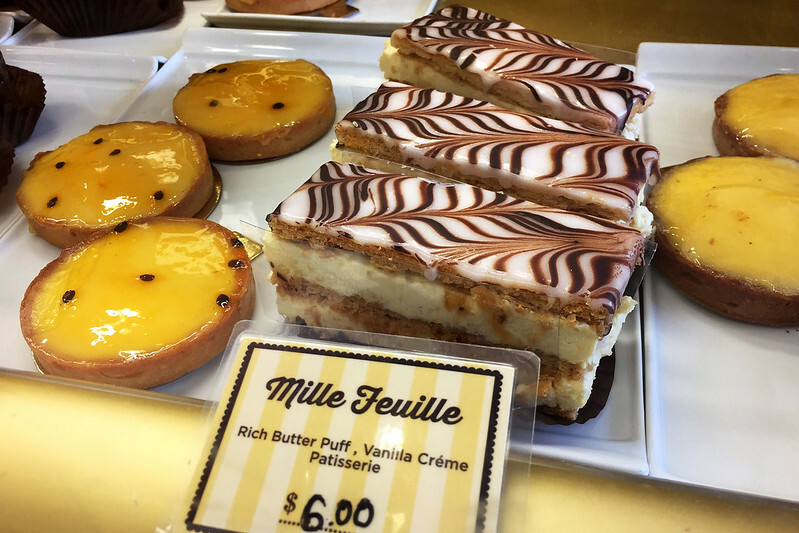 And amongst the sweet French pastries lurks a platter of classic vanilla slices, though labelled with the fancy French name “Mille Feuille”. Naturally, I order a sausage roll and one of the slices, and take them to a high side counter served by an array of tall wooden stools. On the counter is a bottle of water and a stack of drinking tumblers, so I am all set to enjoy lunch. 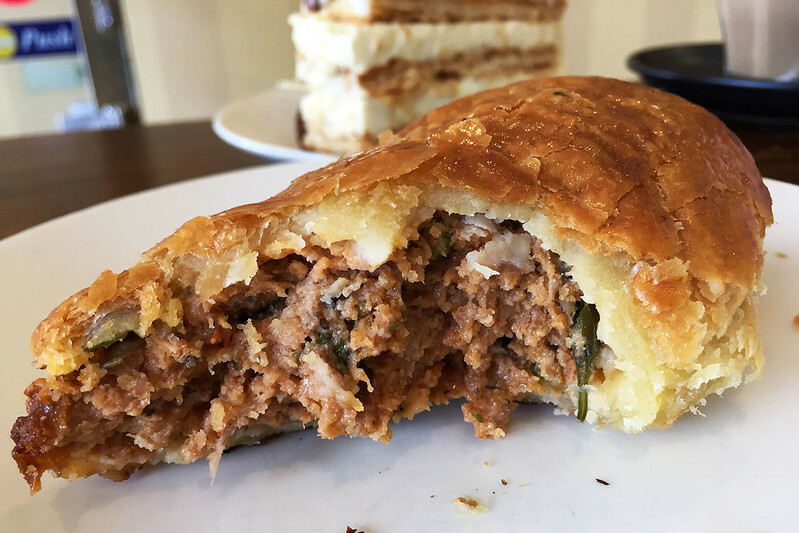 The pork and veal roll is fat and generous size, with a lovely golden flaky pastry. 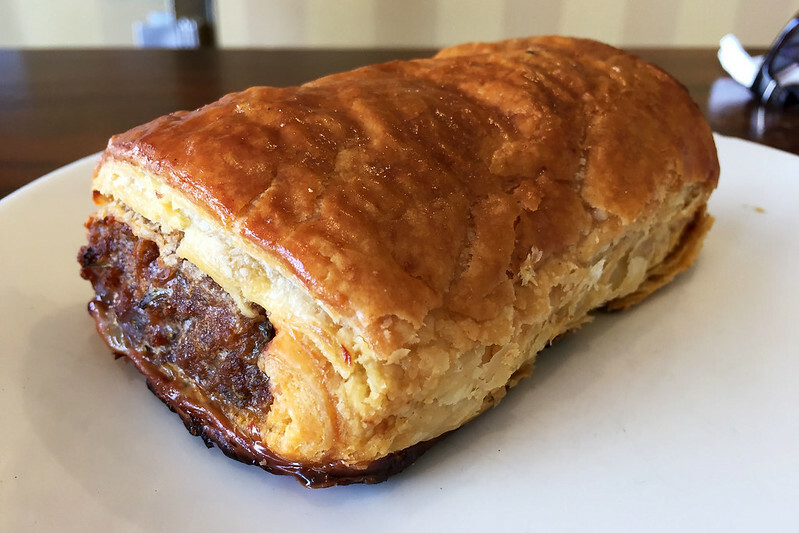 It looks mouth-watering, and as I sink my teeth into the first bite, it is revealed to be rich and buttery as one would expect from a baker versed in the French arts. The pastry is very good, but could be a tiny bit flakier. The mixture of pork and veal inside is coarsely minced and blended with onion and plenty of fresh green herbs, with some small slivers of carrot too. The meat is deliciously juicy and nicely cooked to a delicate tenderness. The filling is really excellent, let down a touch only by the low flakiness quotient of the pastry surrounding it. Moving on to the slice, the first step is to extract it from its casing. The slice is long and narrow, presented on a plate with a brown paper patty tin on the bottom and two thin but stiff sheets of clear plastic lining the sides. I don’t mind this, because it helps keep the shape and prevents the sides from drying out. 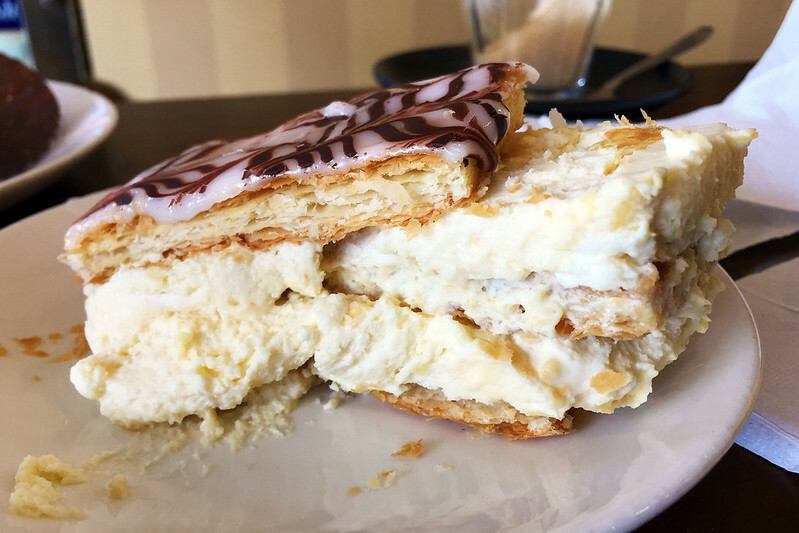 There are three layers of thick, biscuity appearing pastry, with two medium sized layers of a pale yellow custard which looks quite creamy. White fondant icing with the traditional brown zig-zag pattern completes the visual feast. 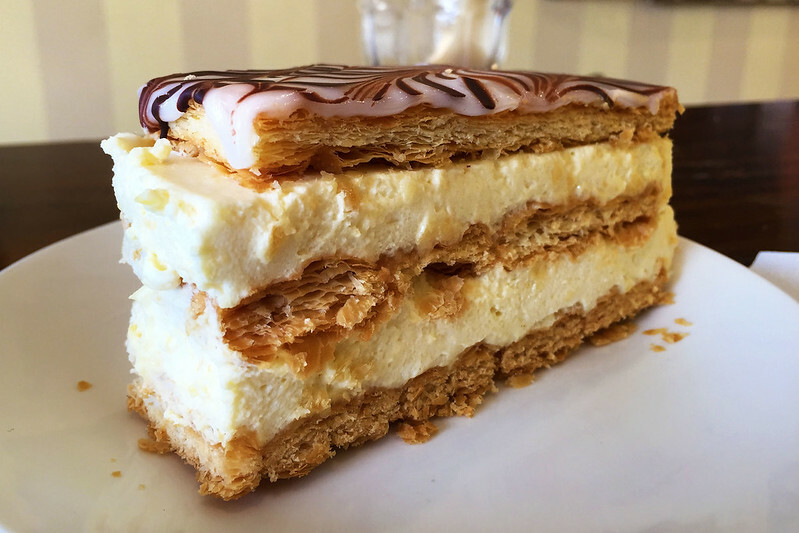 The slice is difficult to manage by hand and disintegrates into slippery layers at the first bite, with the very crisp pastry squeezing out the soft custard all over the place. It is clearly more designed for attacking with a delicate cake fork than munching into with a hand-held grip. The custard is very light and fluffy, more like a whipped cream than a true custard set with egg. Its flavour is more creamy than anything else but there is a detectable note of vanilla. It’s good, but in a delicate French way that doesn’t quite meet expectations for a humble vanilla slice. The pastry is truly excellent though, crisp and flaky and light. The plain sugar icing adds a nice punch of sweetness which assists the mild creaminess of the custard. Overall it’s very pleasant, but would definitely score better if the custard was more dense and, well… custardy.